Amaze us with your pitch for 6 Snickers videos! Guys like to belong to groups - their pack of mates. They abide by a male code of conduct in order to stay in the pack of mates. But when a guy is hungry, he struggles to keep up with the pack and displays out of character behavior. Then he eats a Snicker and gets back to his normal self! It sums up with the end line: “You’re Not You When You’re Hungry”. 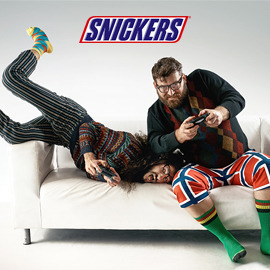 Snickers wants to appeal to Millennials and they want to talk to them through the platform they use, which is YouTube. They have identified topics that guys from 16 to 34 like the most and they’d like your help to create amazing content. Pitch to us your stories for a series of 6 videos for Snickers, around our 6 topics and linked to the idea that “You’re not you when you’re hungry”. Format: Pitch video featuring storyboards or pictures. Looking forard to receiving your pitches before April 10, 2016 23:59 UTC!